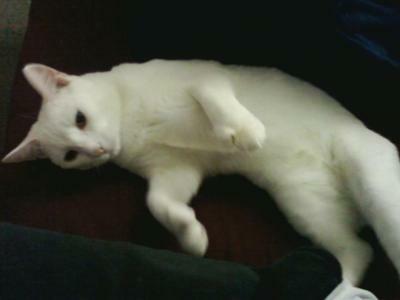 We Love him very much, Seven toes on each front foot...He is pure white, gets into everything. Very nosey. Will roll on his back cause he loves his belly rubbed..He eats alot and definetly very smart...With that extra two toes he can climb the doorways..and trys to open doors!!!! Dunkin is sooooooo cute! My polydactyl cat, Mitzer, also has seven toes on his front paws. He is nosey and loves to eat, just like Dunkin. We are so fortunate to have them in our lives! !